When Jane Goodall was one and a half years old, her mother found her in her crib with a handful of earthworms she'd pillaged from the garden. Little Jane, born with a natural fascination for the living world, wanted to keep them as pets. Her mother, a novelist who was known for her temperate encouragement of Jane's ambitions, wasn't upset - but did want to remove the worms from her daughter's crib. "Jane, if you leave them here, they'll die," she said. In a lesson that would resonate 80 years later, little Jane teetered out into her family's London yard and let her tiny charges crawl back into the earth. 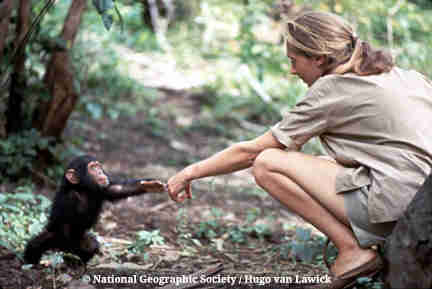 The animal encounter was the first of many that would shape Goodall's life. She read Dr. Dolittle, she hid in a henhouse to see "where the egg came out,"she fell in love with Edgar Rice Burroughs's "Tarzan of the Apes." As she told a crowd during a lecture at the Brooklyn Academy of Music on Wednesday night, there was only one problem with the novel: "He picked the wrong Jane as his wife." A wide-eyed 23-year-old without a college degree, Goodall climbed aboard a boat headed for Africa, an excursion that was virtually unheard of for a young woman in post-war England. But travel she did, winding up in the employ of Kenyan paleoanthropologist Louis Leakey, under whom should would begin her renowned research on chimpanzees in Tanzania's Gombe Stream National Park. Goodall's mother soon joined her in the jungle, establishing herself as something of a "white witch doctor" to the locals, and earning some badly-needed connections to local communities. With only a cook (who, Goodall noted, had a strong penchant for alcohol made from fermented bananas) in tow, Goodall and her mother made a life for themselves in Africa. That was where Goodall made one of science's most important discoveries to date - the use and modification of tools by a species other than humans. The finding rocketed the young scientist to fame, and prompted her to pursue a PhD at Cambridge University. Now, at 81, Goodall is no less energetic - but since her early days as a primatologist and animal behaviorist, her message has changed. She is no longer a passive observer, spending hours crouched in the bush, recording every minutiae of chimp society. "I had a feeling that I needed to give back," said Goodall, adding that it was at a conference in Chicago where she first realized that the problems that plagued chimpanzees in her pocket of Tanzania - bushmeat hunting, wildlife trafficking, deforestation - were running rampant in other places, too. 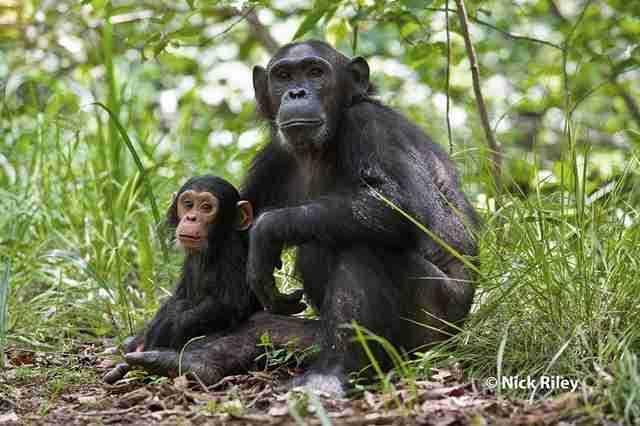 Chimpanzees, Goodall realized, would not live forever unmolested by humans, as she had once observed them in Gombe. Backstage in a dimly-lit room in Brooklyn, Goodall is categorically spritely. She pops about the room, greeting friends and admirers - many of whom line the doors and even spill onto the streets waiting for a woman whose name has become as recognizable as any rock star or celebrity who passes through the venue's doors. Despite the fervor that surrounds her, Goodall is cool and calm as she perches on a couch in her trademark shawl-and-turtleneck uniform, her posture impeccable. 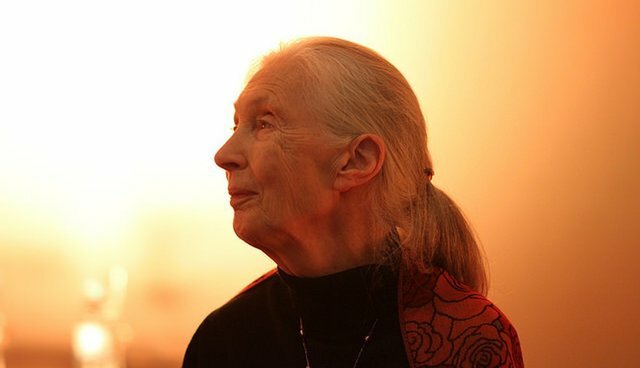 "I feel ashamed of my species," she had told a crowd of hundreds just an hour before, lamenting the havoc she's seen wreaked on the Earth since she began her Gombe research in the 1960s. But now, Goodall seems more hopeful than anything. She's serving as the ambassador for Disney's new "Monkey Kingdom," a feature documentary that follows the lives of a group of macaques in Sri Lanka. Goodall lights up when she talks about the film and its characters. "There's Maya, and her lover Kumar, and the top ranking male Raja, and the sisterhood of these three ugly, awful, terrible females," she told The Dodo, not bothering to suppress a laugh. The significance of the Disney producers naming the real-life monkey characters is not lost on Goodall. 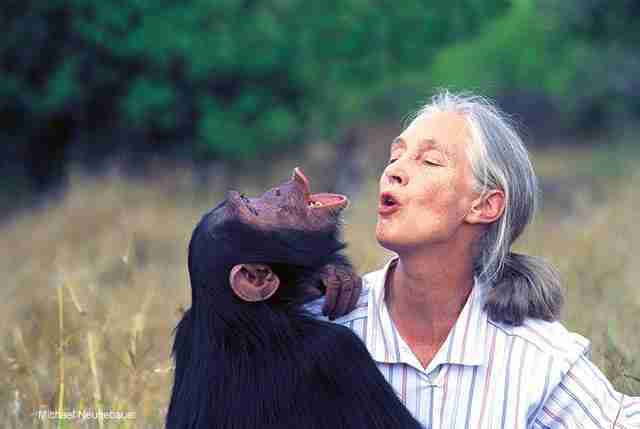 She was once derided by the scientific community for naming the chimps she observed in Gombe. But to her, David Greybeard, Mike, Flo and all the other chimpanzees she met were individuals, worthy of names for the simple fact that they each had their own personality. 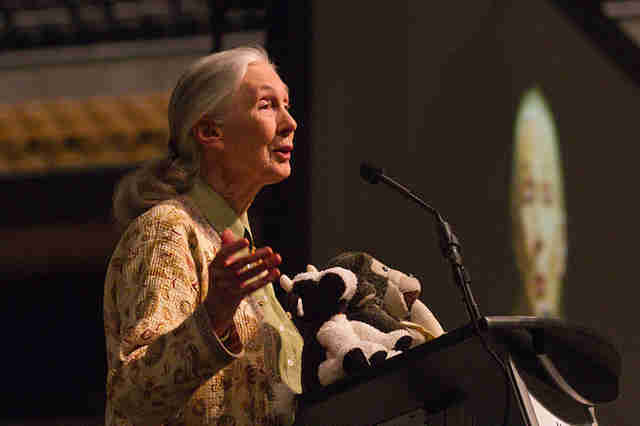 "I think if you give an animal a name, people realize this is an individual, and they can relate to it," Goodall said. "I was told you have to give animals numbers and I thought, 'Well, that's just stupid. Then let's give us numbers! We'd probably be 2,000,000,029.'" Goodall's age hasn't slowed her down a bit. She's releasing a new book about the role that trees and plants play in ecosystems. She's managing a massive network of community groups, many run by young people, under the umbrella of the organization she started, Roots and Shoots. She continues to serve at the helm of the Jane Goodall Institute, a non-profit that works to support humanitarian, environmental and wildlife programs around the world. And through all of this, she's on the road 300 days a year to promote environmental causes and conservation, a travel itinerary that she calls "scary." And Goodall is genuinely hopeful about the advances that technology will bring to her field. When she saw teens texting and tweeting all around her at the People's Climate March last September in New York City, her first thought was that it was a gift to be able to gather so many people - so quickly - with the push of a button. At one point, she stared up into the light above her, spread her hands, and in a low octave, referenced "the cloud." Goodall has a couple of faithful friends who accompany her on her travels. 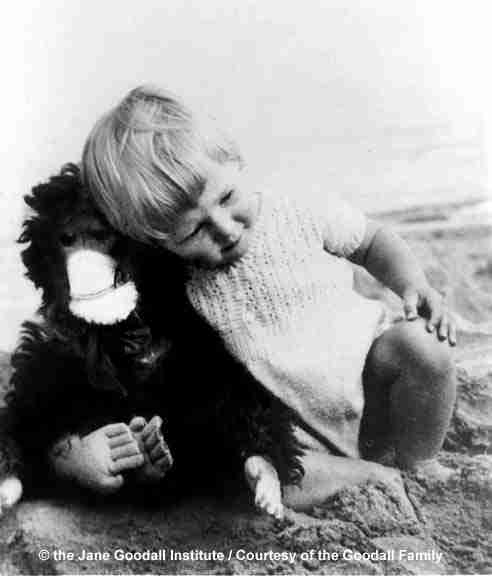 She now carries (along with a stuffed chimp named Mr. H who's visited 60 countries with Goodall) a stuffed cow, meant to symbolize her newly-discovered campaign against factory farms. "Agribusiness is one of the horrors being inflicted on this planet," she told the crowd in Brooklyn, adding that she's become a vegetarian in recent years after reading about intensive farming, and urges others to do the same. Goodall spends the majority of her time thinking about some of the world's greatest problems: factory farming, biodiversity loss, climate change, poverty. But clutching Mr. H in her folded arms, and wrapped in a maroon shawl, her eyes shining as she recalls her days living among chimps in Gombe, it seems the spirit of the little girl with a handful of earthworms never entirely left. And she hasn't forgotten the first group of chimpanzees she met, who now have a whole list of grandchildren living in the same forest. "I don't think of chimps as animals," she said. "They're chimpanzee beings, and we're human beings - and they're not really like animals to me."